Whilst the film brings up a series of profoundly important points that urgently need to be critically reflected on, this quote by Vandana Shiva was something that I kept thinking about. I had read much of her work in the past – on bio-patenting and its disastrous effects on local communities and also her writings of ‘monocultures of the mind’, or how schooling tends to encourage singular and universal ways of thinking and learning, rather than encouraging diversity and plurality. All of the writing I have encountered from Vandana Shiva is provocative, political and poetic. I am a fan. While I was not surprised at her being included in the film as a speaker, I was surprised to hear of her particular focus on higher education – with grandparents as taking the central role of the leading teachers and thinkers. I could clearly relate to the logic of her argument. I knew something of the importance of Elders, especially within indigenous communities. I also feel deeply about the devalued place that grandparents and the elderly generally hold within so-called industrialized societies. During this journey, Udi and I have come to understand much more of the importance of knowledge and experience that can/should be valued from grandparents and Elders in communities. We encountered the significance of this from the very beginning of our journey, during our time in southern Alberta, with the Blackfoot community. We learned about the traumatic experiences of the past, the processes of healing in the present and the future of Blackfoot language and knowledge that is kept but also re-generated and re-claimed with the support and encouragement of Elders. 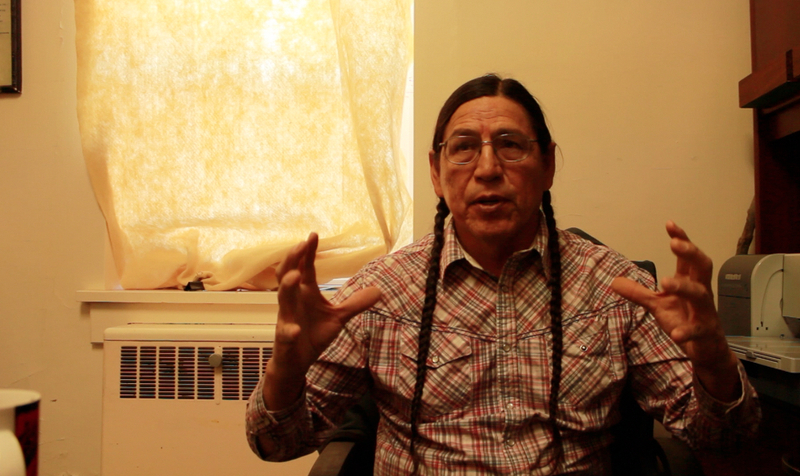 Interview with Narcisse Blood, Black Elder, curriculum writer for Blackfoot Pedagogy and teacher at Red Crow Community CollegeCurrently, the Elders of the Blackfoot community actively participate in the teaching and learning process within Red Crow College. Not only were the Elders active in the preparation of the curriculum (Udi has described in previous posts the inspiring story of the repatriated beaver bundle and how this led to the ‘Blackfoot learning with the land’ curriculum that Ryan Heavyhead and his wife Adrienne developed through their own learning of how to traditionally bring beaver bundle ceremony back into practice), they teach and also declare and provide their own degrees which are not provided by the University of Lethbridge. For example, Ryan Heavyhead is recognized as having a PhD in Blackfoot ways of knowing from Blackfoot Elders that is not recognized by the University of Lethbridge. 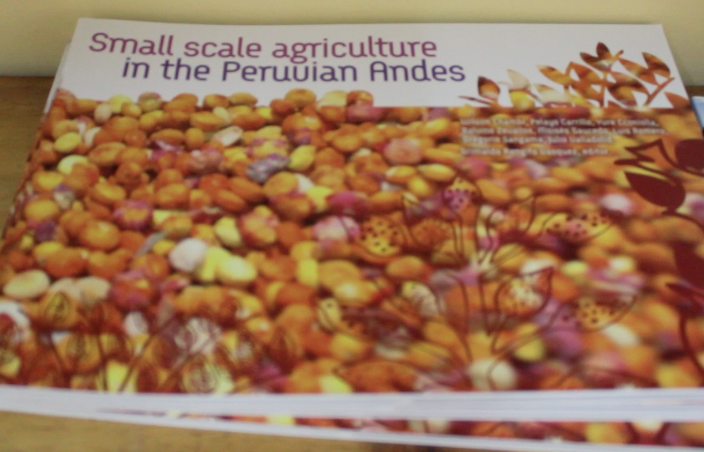 During our time visiting with Pratec, in Peru, this understanding was furthered. Greatly. 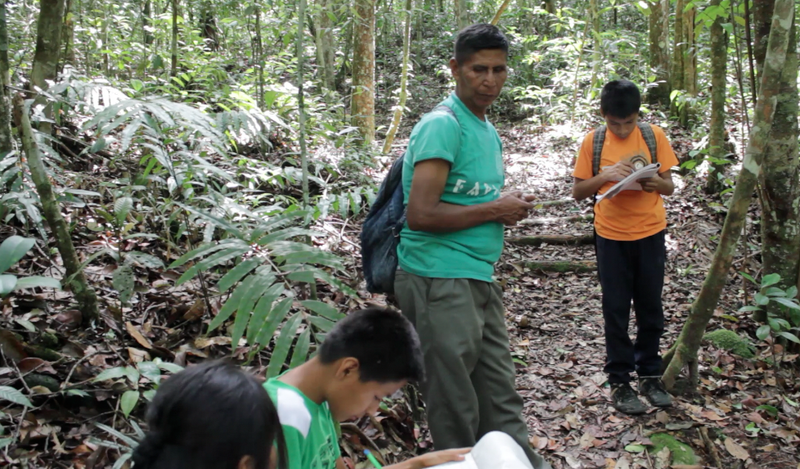 Udi has described some of this in his post on the Quechua grandfather coming from Wayku (the Quechua village next to Lamas) to teach the Quechua children and young people more about the sacredness and depth of knowledge that is within the forest of El Monte. The grandfather’s knowledge and the Quechua cosmovision was demonstrated by the tobacco ritual he offered to purify each of our bodies as we entered the forest that was once one of the most sacred hunting grounds of the Quechua Lamas. This process of purification is also a process of respect toward the guardian of the forest. It is an act of reciprocity to also be looked after safely – and previously, to ensure a successful hunt. 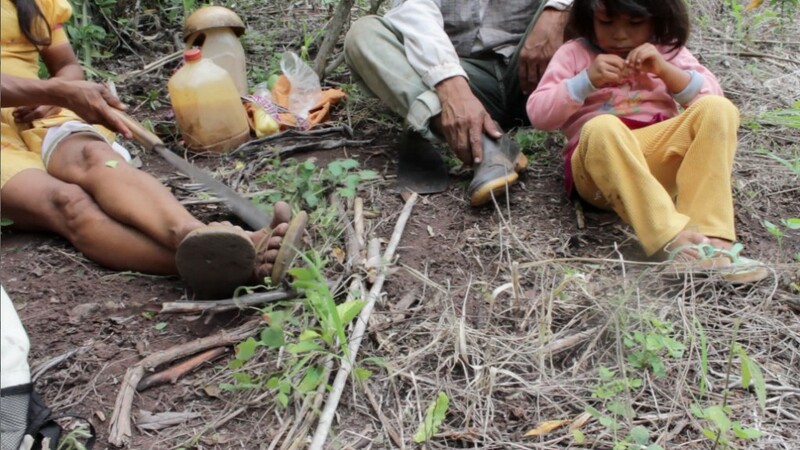 The grandfather also offered many stories of particular plants and animals, how they act as different types of medicines and how we can interact with them, as we ventured through the forest. 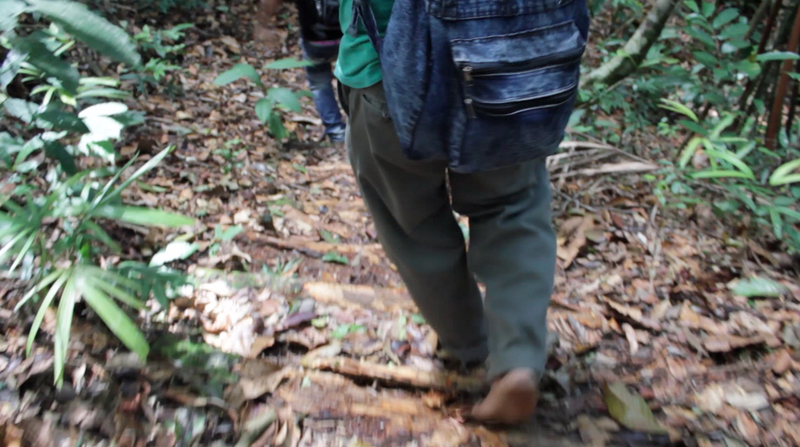 I remember noticing his ease of walking through the forest, his feet bare, his body more deeply connected to the Earth. 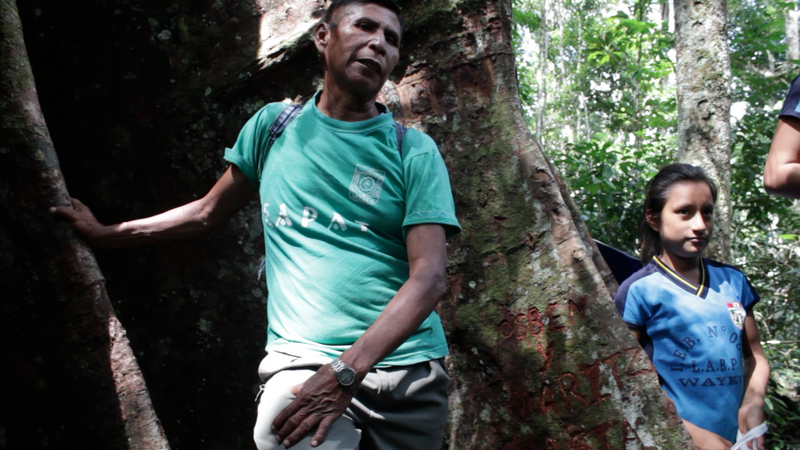 For Udi and for me, we would have liked many more hours of time with him there in the forest, to hear his stories and deep knowledge he has with the living beings that make up the forest. The encounter that we did have, with his knowledge and story-telling, made the forest come alive. I felt a sense of the soul of each individual being in the forest as we passed through in a new way that I had never experienced. 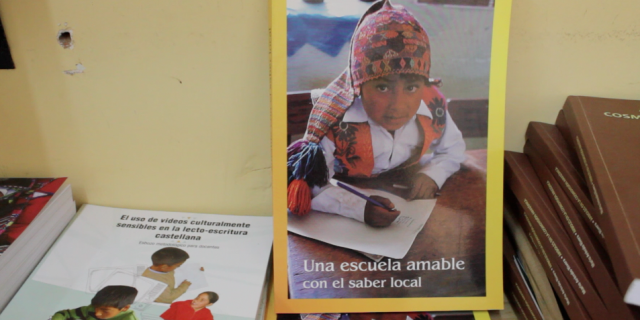 The day before we visited El Monte, Lucho had taken us to a ‘grandparents school’ in a Quechua village 45 minutes outside of Lamas. On our way to the village, I heard Vandana Shiva’s quote echo in my head, and I wondered how much the experience would resonate with her vision. It was a hot afternoon. The sky was cloudless and the sun felt relentless. We sat with a family in the village as we waited for the grandparents’ gathering to begin. There were five or so children, boys and girls, and a mother and father of three of these children. 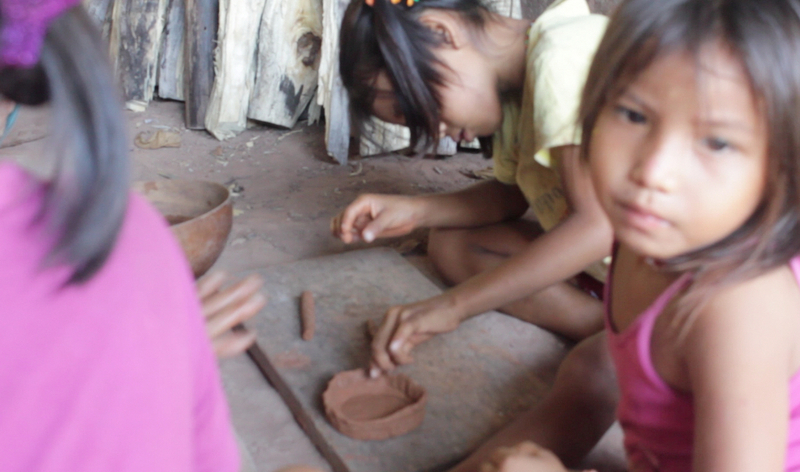 The mother was molding a bowl from wet clay, her two young daughters helping – one watching and the other starting her own. The bowls would be used during each meal once dried in the hot sun. 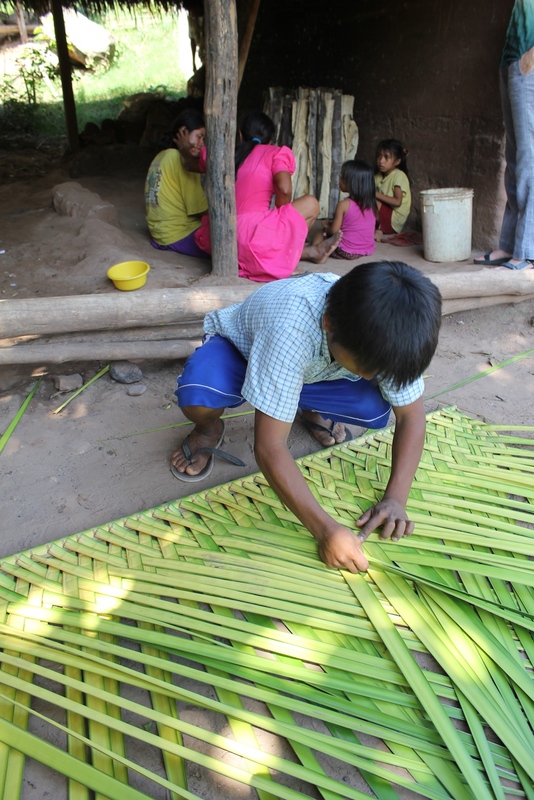 The father had taken a large palm branch and was using a machete to cut and twist various leaves for weaving. 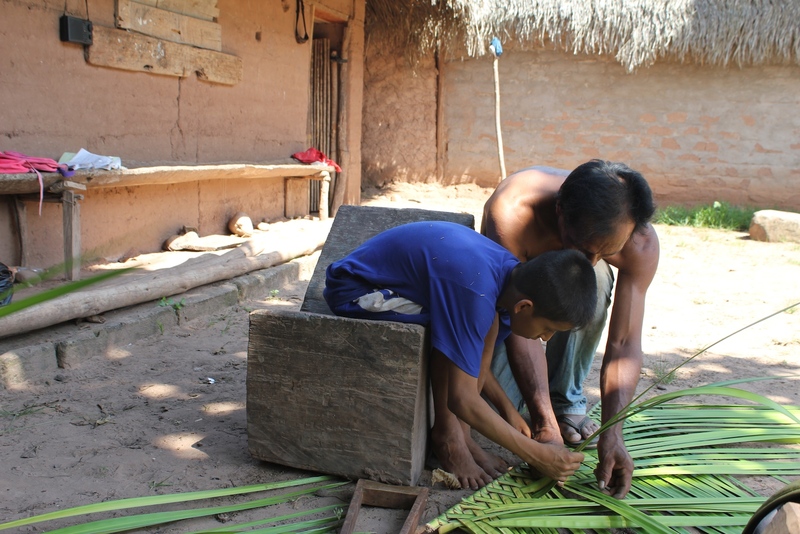 His son came over and started to weave the palm leaves with his father helping him, giving him instructions and showing him what to do when needed. 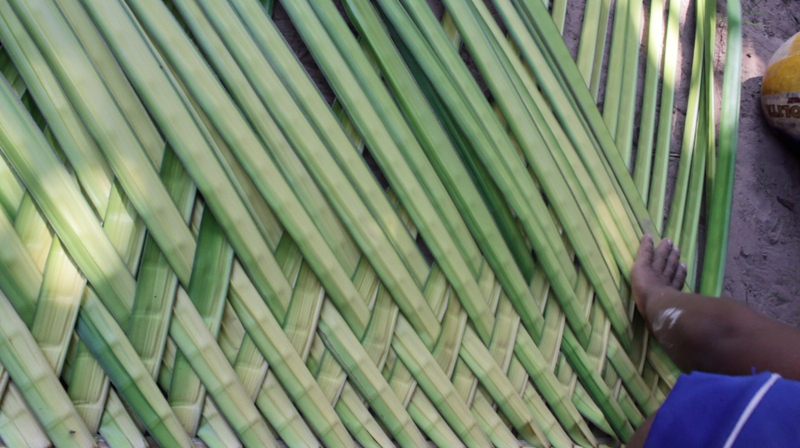 The woven palms would be used as mats (typically about 4ft by 6ft – or 1.5m by 2m) to sit on, to put on the walls or even used as walls. Udi had a conversation with the father about what was being taught (weaving and pottery) and how important it was for them as a family but also as a community. The grandparents ‘school’ occurred several times per week, after the hours of formal schooling, offering different learning experiences for the children, but also adults, that were not offered within the school. 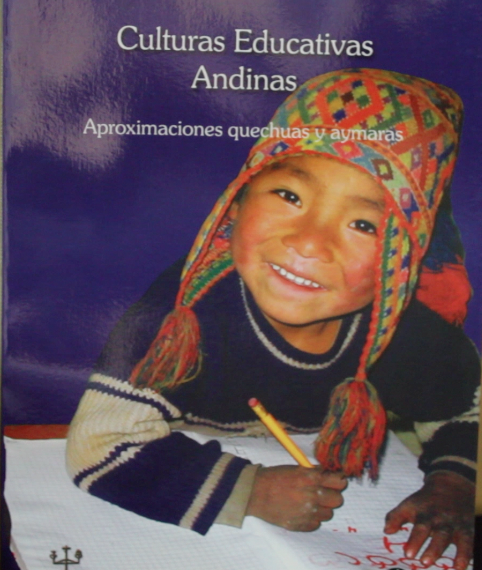 These various activities, central to Quechua ways of knowing and being are not a priority within the walls of the classroom in spite of the claim of Quechua ‘inter-cultural’ learning and teaching that is offered in all schools in the area. After nearly an hour, some kids came and ushered us into a house. We entered a large room and were shown to a seat along a long piece of wood that had become a bench. There were 5 women sitting against woven mats that were lining one wall. I guessed they were aged between 30 and 70. There were 9 children in the room, girls and boys, the youngest looking about 4 years of age. 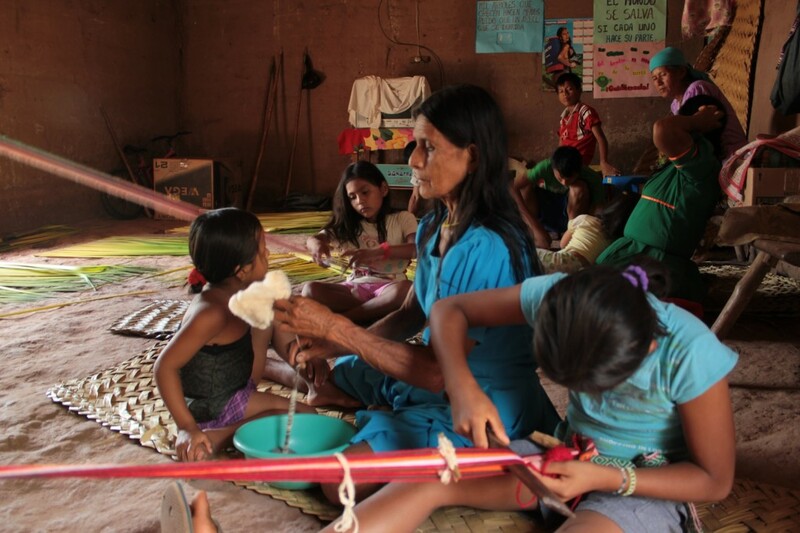 Colourful threads of yarn were tied around posts and several girls were beginning to weave – belts, blankets, skirts, etc.. Another little girl was working with a very old woman, the grandmother of the ‘school’ to spin cotton – again for different types of clothing. Several younger boys were on the far side of the room with the grandfather, weaving mats from palm leaves, similarly to what we had just observed outside. The grandmother came to speak with us, her face in a constant smile, tremendous warmth emerging from each line on her beautiful face, touching all parts of me. Udi had a difficult time understanding her Spanish and once Lucho came in we were able to converse more easily. The little girl who was spinning cotton seemed nervous next to us and I was told later that I had cat eyes which scared her. We moved around the room and were shown slowly and deliberately the different forms of artistic and practical materials that were emerging. There was gentle interaction between everyone in the room and quite intense concentration. These gatherings happen at least 3 times per week. 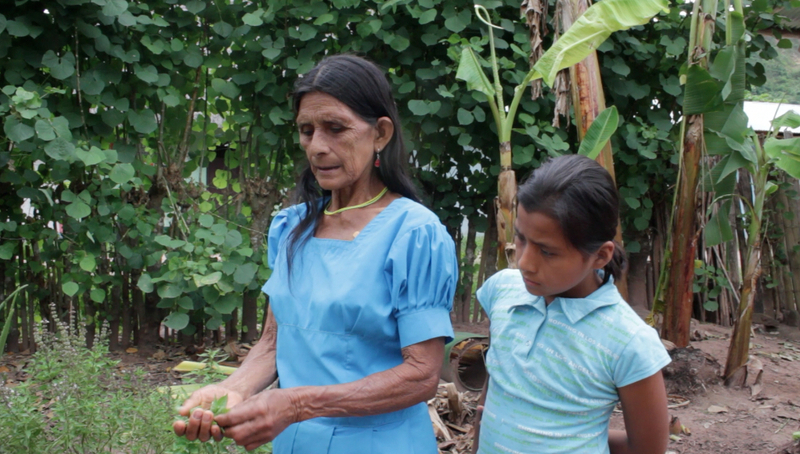 A little while later, the grandmother took us outside to show us her medicinal garden. I was really excited to learn from her as I have always been keen to learn much more about natural healing. She gave us a tour, describing the great variety of plants outside. Her wisdom and warmth were captivating – as were her descriptions of the multiple plants and their healing benefits. There were many there that supported all aspects of pregnancy – from helping with fertility and conception, to health during pregnancy, healing during miscarriage, to reducing pain during delivery, to speeding up the birthing process. There were plants there to be used as anesthetics, antiseptics, pain-killers and basic nutrients rich in various vitamins and minerals. 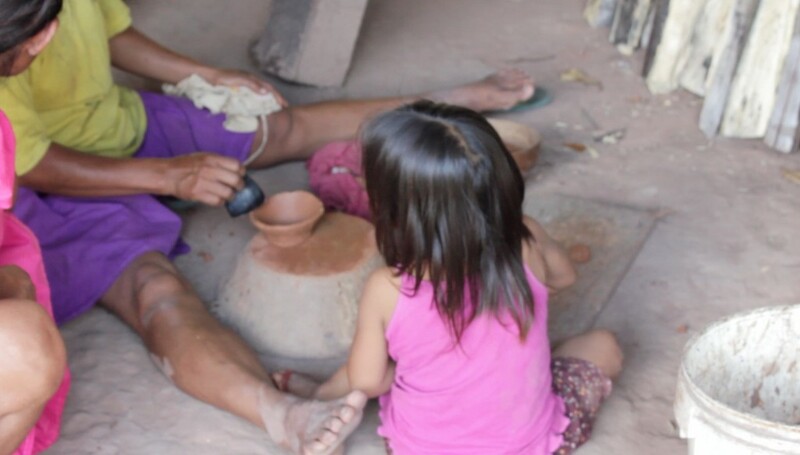 She told us that in addition to weaving and spinning that the children come to work with her out in the garden, cultivating and nourishing the plants – whilst learning about the various ways they heal and nourish them. I wanted to attend this school – this grandmother’s university! Weaving hats, mats, walls from palm leaves; spinning and weaving wool; embroidering complicated and colourful patterns onto materials for skirts, tops; cultivating medicines for every health complication, particularly for women; cultivating foods from their chacra for sustenance and nourishment… I know I could greatly benefit from such a wealth of knowledge. I doubted that either grandparent could read or write in our measured forms of literacy. Yet – the forms and depth of literacies I had just experienced far exceeded my own. The terms choba-choba and comunalidad come from different cultures and places (Peru and Mexico). Yet, they share a common bond of inter-connection. In this post, Udi and I tell a bit about how we came to learn something of these different (but similar) ways of being and understanding the world. Our first morning in Lamas, in the Northern Amazonian region of Peru, Udi and I walked the ten minutes from the Hospedaje Girasoles guesthouse (highly recommended by the way), through the far end of town and down the reddish-coloured mud hill that is surrounded by forest on one side of the road, to the entrance of Waman Wasi. There was still a cool breeze in the air but the tropical sun was gathering strength. We were meeting Gregorio, one of the three main members of staff at Waman Wasi, who was taking us to several chacras that morning a few kilometres outside of Lamas – to meet with families working the land through choba-choba. Gregorio lives in Wayku, the Quechua Lamas section of the town and travels often to meet with different Quechua families around the region. The evening before, there had been a brief introduction to the cosmovision and activities involved with ‘choba-choba’ and its association with ‘chacra’ – during Lucho’s overview of Waman Wasi’s work presented to a group of European students. 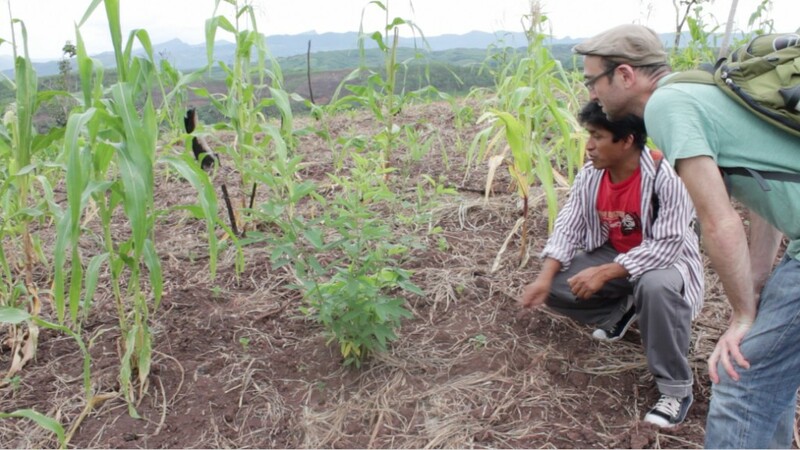 Udi and I had an understanding that the ‘chacra’ was similar to the ‘milpa’ in Mexico – land is cultivated in a way that imitates and is intimately connected to natural processes. 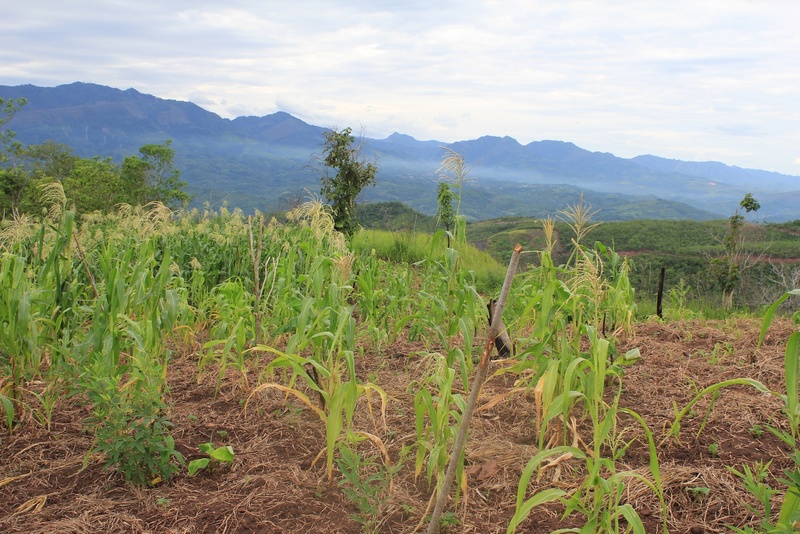 In a chacra or milpa, Rather than planting one crop as tends to be the agricultural norm, different types of foods are planted together (typically maize, beans, squash and chili) with the intention of nourishing the land as much as to nourish those eating from it. Choba-choba to the Quechua Lamas is the way that family members and friends came together to cultivate the land, dividing up responsibilities in accordance to ability and strength. 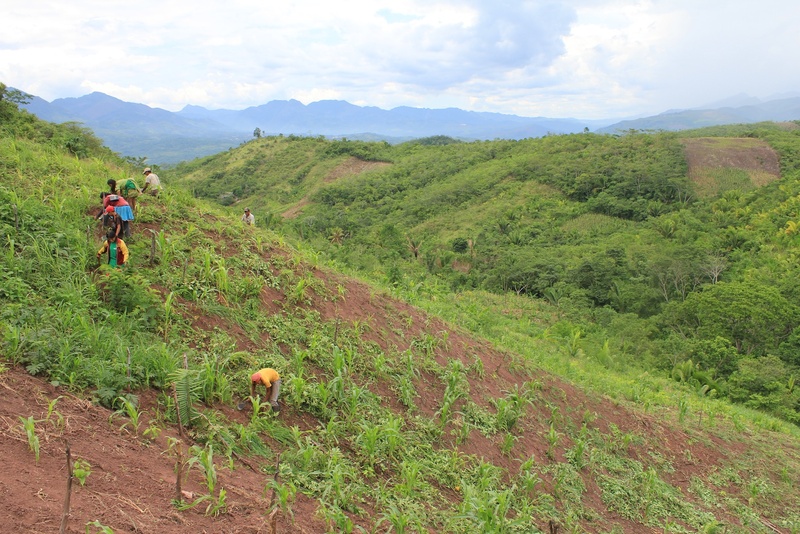 Through choba-choba, there is no need to pay anyone from the outside to help with planting and cultivation as choba-choba entails reciprocity and abundance. The idea is that all that is needed is already there. Every person, regardless of age and gender gives to the process and also receives. Along the walk, Udi and Gregorio were deep in conversation, about the nuances of the land in the area, about different agricultural processes and techniques of growing food, about the continual deforestation in the region, about the insidiousness of mining companies and the weakness of the government condoning their exploitative modes of intrusion and extraction, about the importance of the chacra and choba-choba, about different species of plants that we passed along the way. I was envious of Udi being able to converse so freely in Spanish. I was catching about 15% of the conversation and yearned for much more. Udi generously broke the flow of conversation many times to translate some of the missing details. We walked further, through thick forest and down steep chacras where a view of the surrounding landscape was alive with undulating hills of greens, a diversity of foods growing within them. Suddenly there were people – children and adults, male and female, at the bottom of a steep hill, in a line, working with what looked like small sickles, on the ground. After a series of holas and handshakes, we sat down and spoke with the eldest members of the family. They spoke to us about what they were doing. They were planting beans and maize on that day, but would return later to plant chillies and squash when the moon was right. All of the children and young people were related within the family. 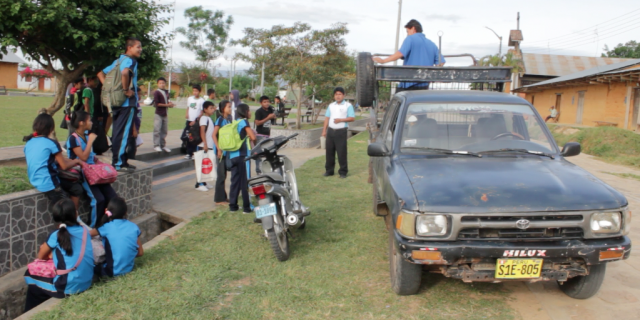 On most days, the children and young people went to school in the mornings and came back to work on the chacras in the afternoons. 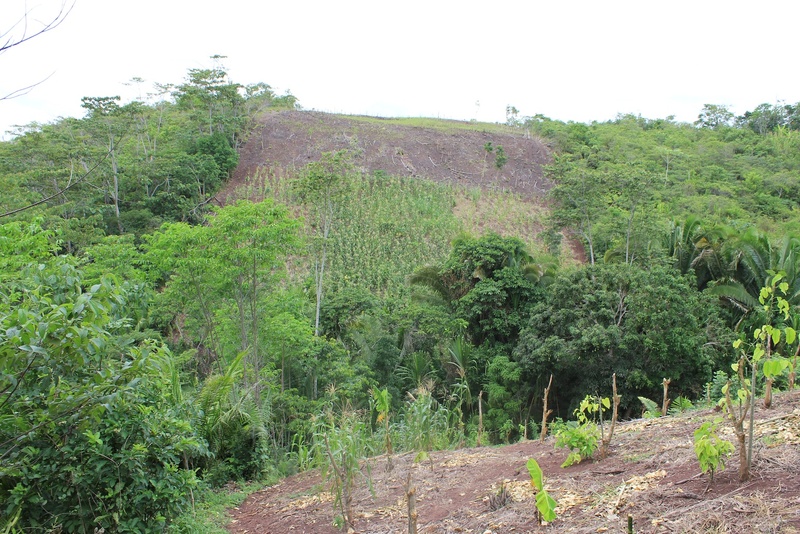 This was the first planting that had been done in this chacra for several years as it had been lying fallow to re-nourish. Chacra and choba-choba occur in alignment with lunar cycles, a sophisticated and ancient form of knowledge which is ignored by the vast majority of the world. More chicha was offered, the taste was refreshing, slightly sweet. We said good-bye after 45 minutes or so and the elder man, the father of the family, walked us through another thickly forested area to visit with another choba-choba. We walked for another 30 or so minutes, up and down steep hills, some forested, some chacras, my legs becoming increasingly tired under the increasing strength of the sun. 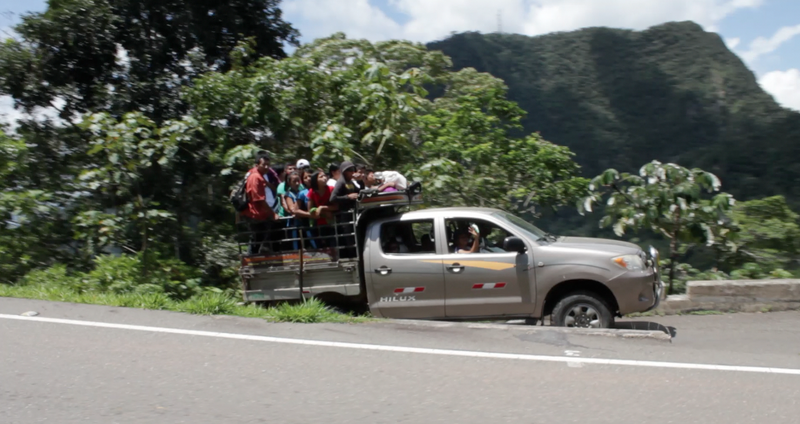 Another line of people came into view – different ages, male and female, near the top of a steep hill. The arrangement was similar, some people were actively pressing their sickles into the ground, digging up the dirt and putting in different small plants and seeds whilst others were resting. 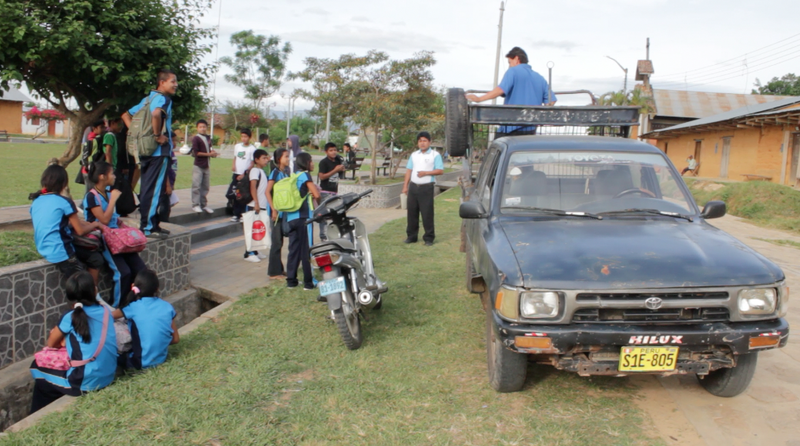 There were again a series of friendly holas, warm smiles and handshakes. Within both choba-chobas was an atmosphere of joy and conviviality. The heat, which at that time was intense, did not seem to increase anyone’s irritability. Rather, there was lots of laughter and joking around. This is not to say that the work everyone was doing was not difficult. It was very difficult, exhaustive and physically demanding. 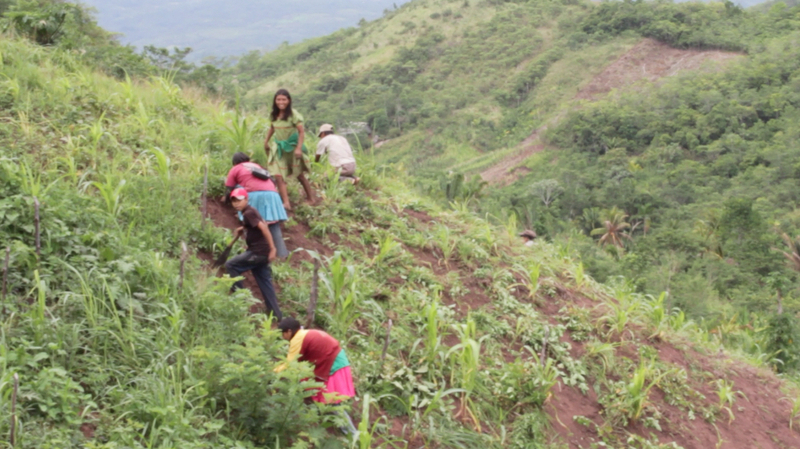 The atmosphere of doing choba-choba work is within a framework of sharing – not just within the family – but with other families in the area and also with a deep sense of reverence to the nourishment of the land. 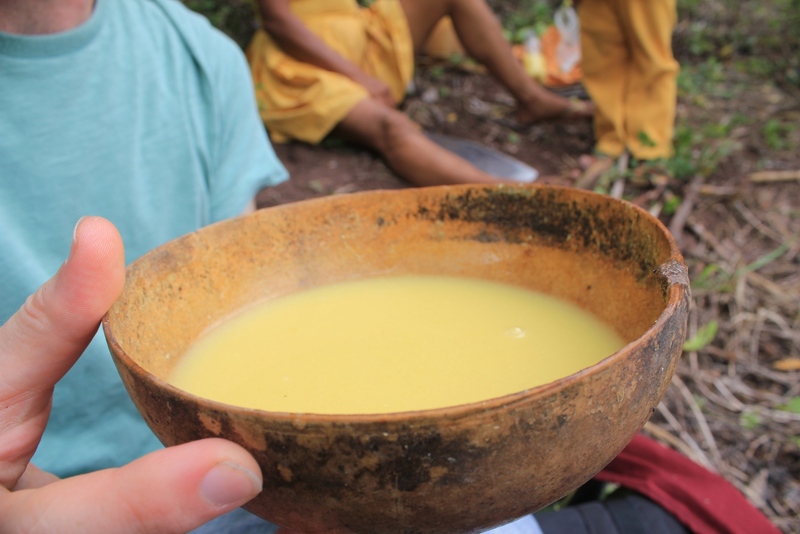 This reciprocal form of nourishment has been at the cultural core of Quechua life and is a far cry from industrialized forms of agriculture that is extractive and dependent on monetary exchange, rather than nourishment to all those humans and non-human beings involved. The term choba choba is a Quechua word that means ‘hair with hair’ (choba means ‘hair’ in Quechua Lamas). The significance of the meaning of choba-choba comes from the interweaving of hair braids that occurs during marriages. This notion is extended to the interweaving of people, communities and the land. One choba-choba inter-weaving of the land with people influences the next choba-choba and so on, strengthening the social fabric of communities. Gregorio, through his work with Waman Wasi, helps to strengthen choba-choba, providing materials (sickles) when needed, visiting continually and sharing fiesta and laughter. 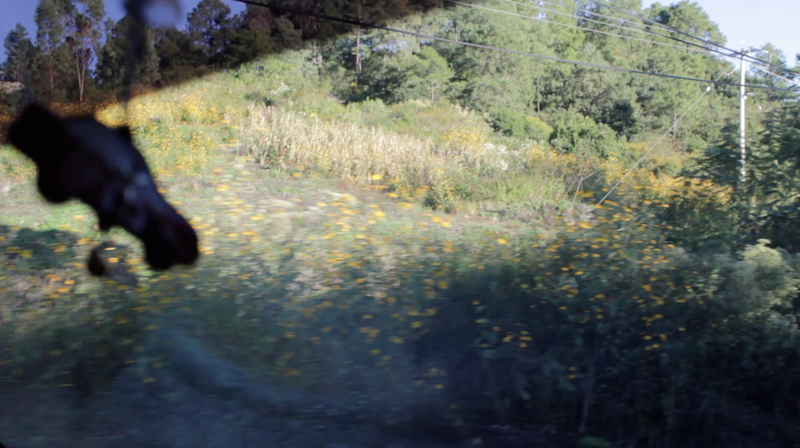 Cut to the deep green undulating hills above the city of Oaxaca, Mexico. 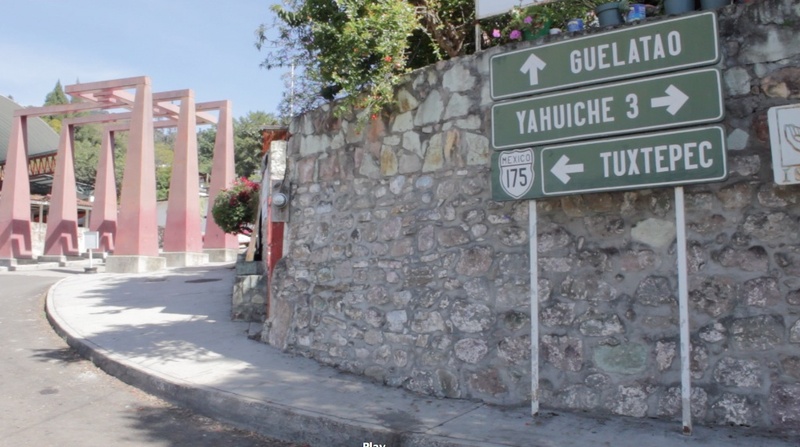 This is where we met Zapotec anthropologist and community activist Jaime Martinez Luna in his village of Gualetao birthplace of the only indigenous Mexican President, Benito Juárez, serving five terms between 1858 and 1872. 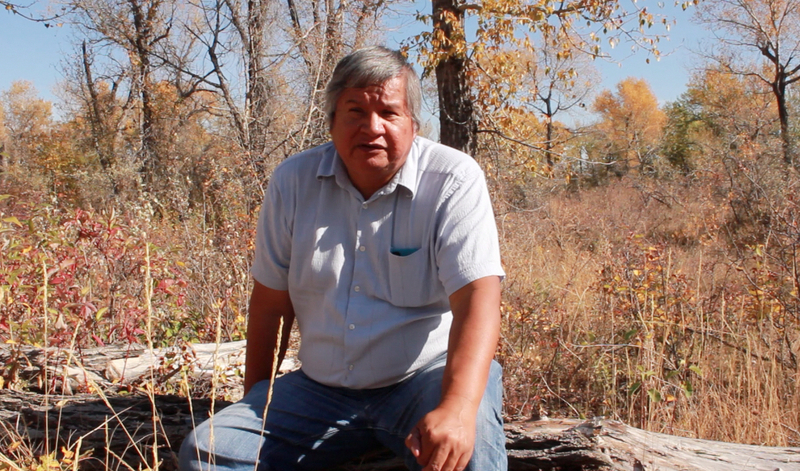 We first came across Jaime in the chapter he wrote for a book called New World of Indigenous Resistance. The book is a collection of chapters by writers across Latin America in response to transcribed interviews with Noam Chomsky on the history and continuing legacy of colonialism, state and corporate power in the continent, and the effects on and responses by indigenous communities. Interestingly, the majority of the chapters focus on education. 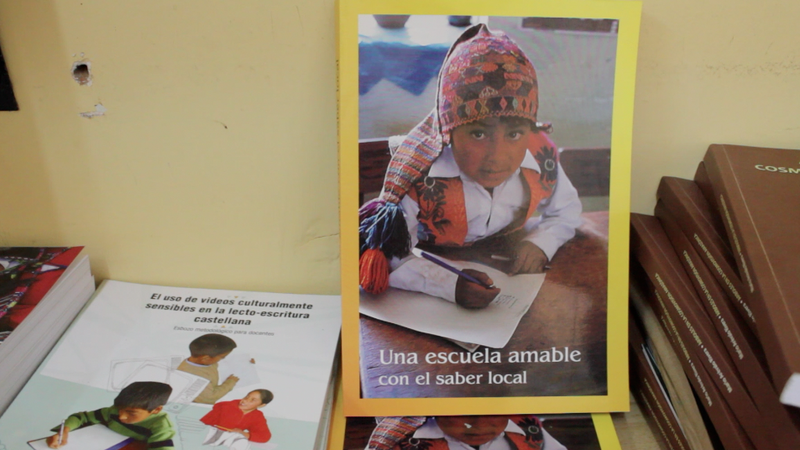 We found this book in a wonderful bookshop, Amate, in Oaxaca. Jaime kindly replied to our email inviting us to his village, nestled high up in the hills an hour outside of the Oaxaca. We are tightly positioned together in the front seat for over an hour. Although uncomfortable, it gives us a much better view than had we sat anywhere else. The car stops quite suddenly. 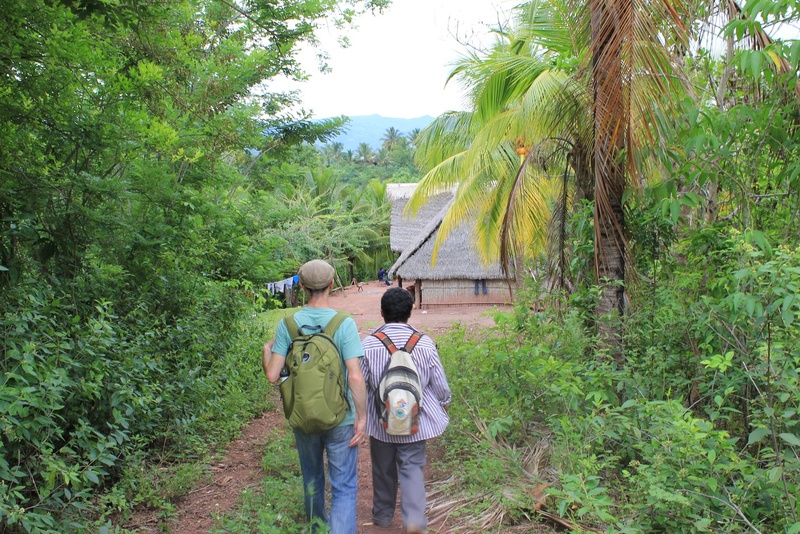 We have arrived at the entrance to the Guelatao village. There is a small road leading up a steep hill. We immediately walk to the top of the hill to check out the village. After briefly capturing the beautiful view which stretches across miles of rolling hills and mountains, we explore the lagoon, the government building, the giant statue of Benito Juarez and mural – we ask a woman at the shop where to find Jaime. 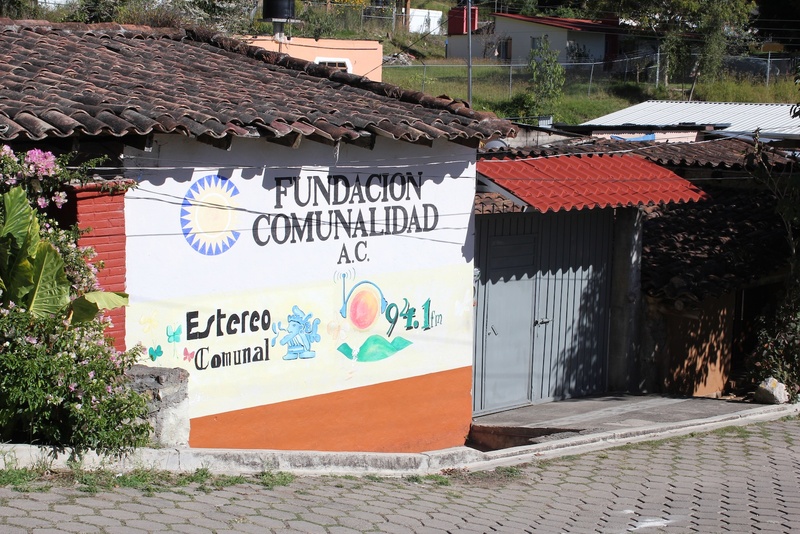 His office is just around the corner where there is a sign ‘Foundacion Comunalidad’. Jaime is inside and invites us in. He is very tall and lanky. His voice is deep and melodious, Leonard Cohen-like. We are not surprised discovering later that he is also a singer, a musician and has published many cds. Jaime speaks with a different Spanish, very slowly, enunciating each syllable with purpose. Kelly is even able to understand much of what he is saying! We arrange to meet later, to record a conversation by the laguna. In the meantime, we find a restaurant to sit and write and enjoy some home-cooked Zapotec food. Comunalidad is a way of understanding life as being permeated with spirituality, symbolism, and a greater integration with nature. It is one way of understanding that Man is not the center, but simply a part of this great natural world. It is here that we can distinguish the enormous difference between Western and indigenous thought. 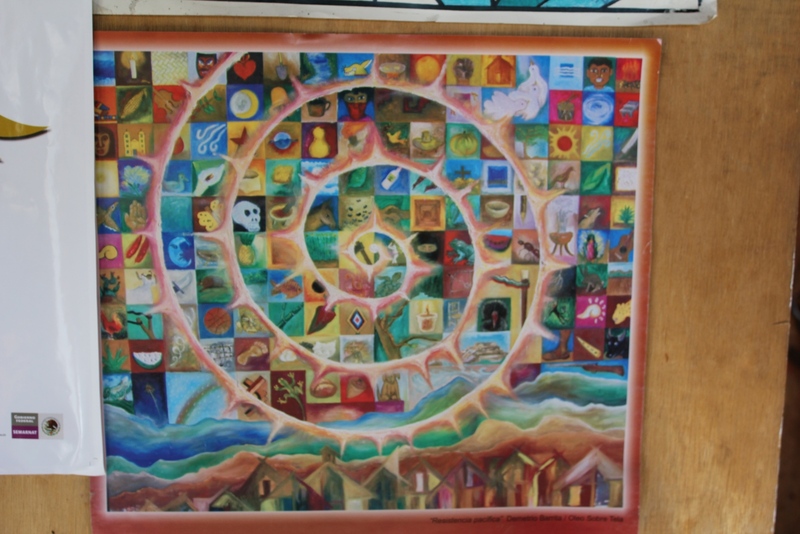 Who is at the center – only one, or all? The individual, or everyone? 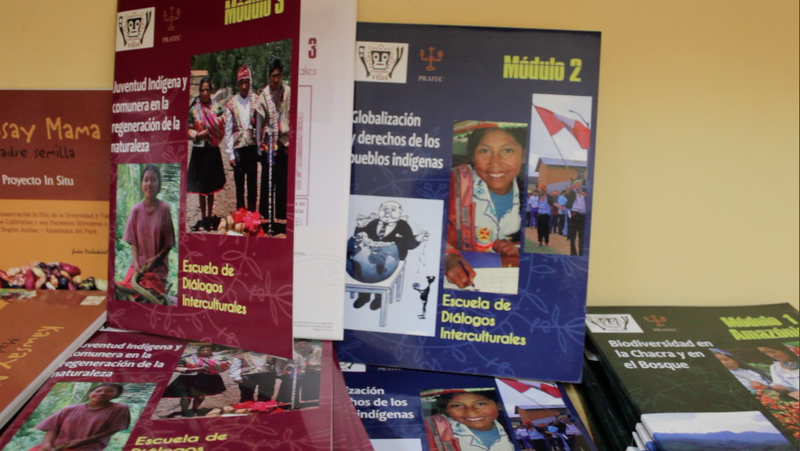 The Indigenous State Forum of Oaxaca in 1997 stated that the school had been the main instrument for the destruction of indigenous cultures, dispossessing them of their way of being and seeing the world to ‘Westernise’ then. 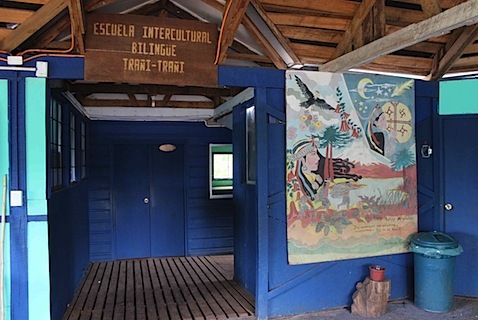 To counter the destructive effects of the school indigenous teachers and community activists have been advocating for interculturalidad in schools, an intercultural education that grounds students in and in between two cultures. 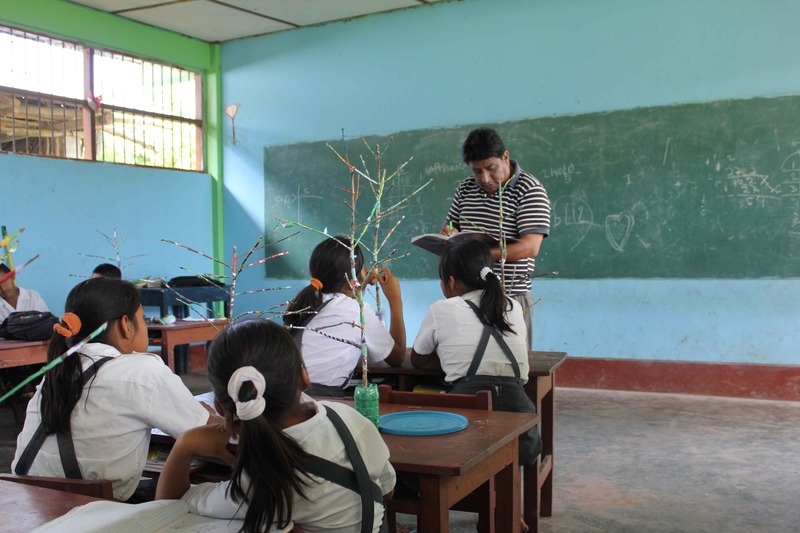 A key concept in this struggle for intercultural education in Oaxaca has been comunalidad a word that the State Education Act of 1995 added as a 4th guiding principle of education, alongside democracy, nationalism and humanism. (Jaime comments in his chapter that this may have been a response of local government fearful of the Zapatista uprising of 1994). Territory involves knowing the land where one is, the place that sustains the community, its history and stories, its plants and animals, not unlike what the Blackfoot where also teaching at Red Crow around place-based learning and traditional foods. Work involves the different kinds of jobs and skills that people from the community take part in and which is not necessarily only about an individuals’ work and skills. This can also be about collective or cooperative forms of work such as the choba choba in Peru, or the mutirão in Brazil. 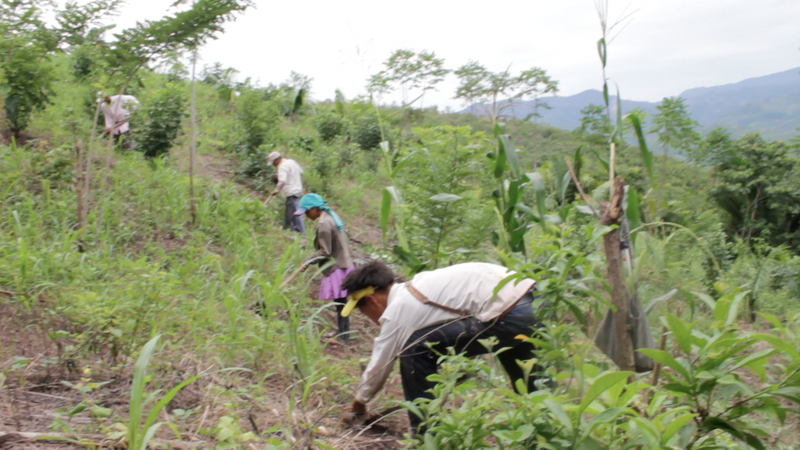 The organisation of community life in indigenous communities and around Oaxaca happens through the various assemblies and individual roles of responsibility, cargo, which take charge of different aspects of the community. Lastly, the fiesta is the celebration of work, of the community and the land, also having as Jaime points out, a spiritual dimension. It is the culmination of community life and comunalidad. There is much more for us to learn about both choba-choba and comunalidad. 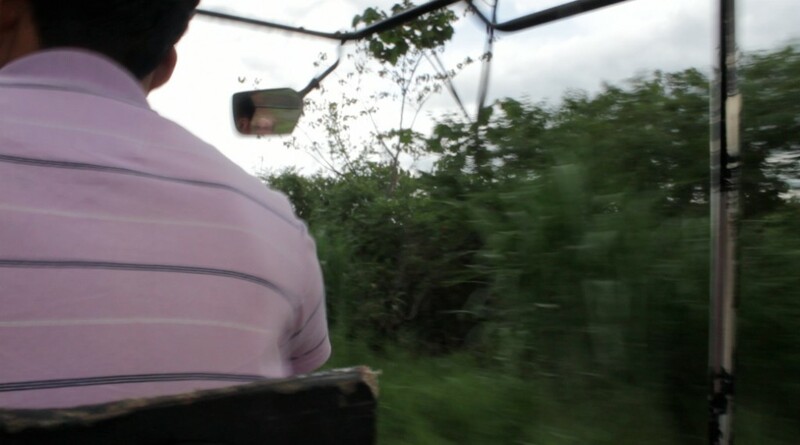 By being immersed for the time that we were in Oaxaca, in Guelatao and in Chiapas and hearing repeatedly the term comunalidad, we began to learn, to feel, what it meant – the significance of it. 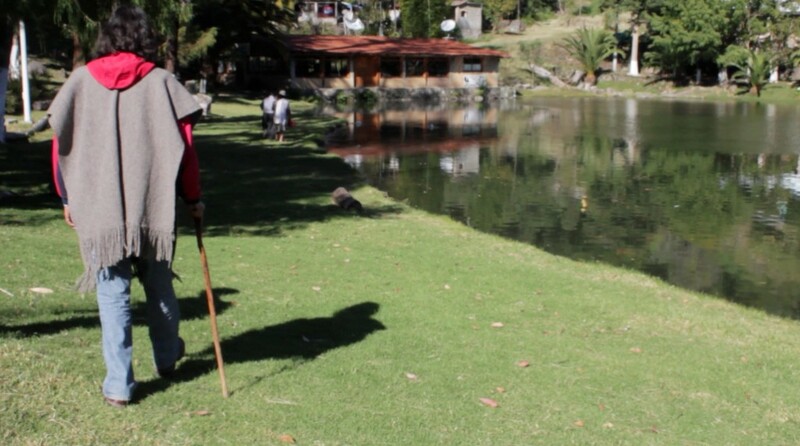 Then by walking and pausing within the chacras around Lamas with Gregorio, we learned more about not only what comunalidad means, but could better comprehend and value the cooperative and communal gift-practice of choba-choba. We are sitting in the beach-front barrio of Barranco under a once again grey Lima sky relaxing in a cafe after another danger-taxi-ride through the aggressive traffic. 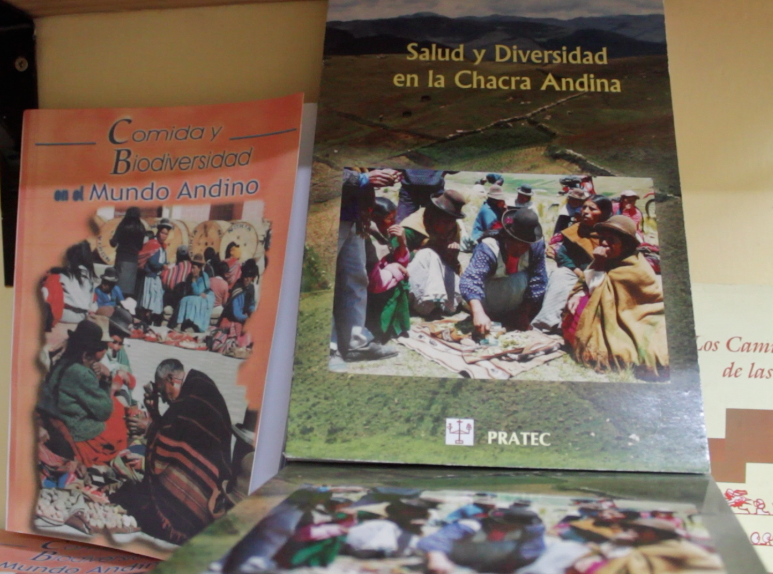 We have just had a 90min meeting and interview with Grimaldo Rengifo Vásquez one of the founders of PRATEC (Proyeto Andinas de Tecnologías Campesinas) a grassroots network of organisations working with indigenous communities throughout Peru through a perspective that values and seeks to strengthen Andean knowledge and practices. 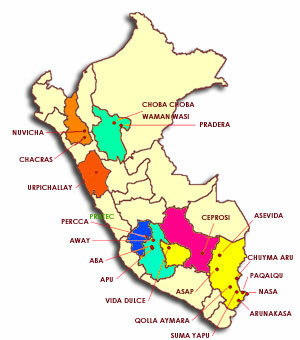 The organisation was started in 1986 by Grimaldo Rengifo Vásquez, Eduardo Grillo, Francois Greslou and Marcela Velásquez development and agronomy professionals who were dissastified with the development models that had were being unquestionably applied across Peru and elsewhere. As Frederique Apffel-Marglin wrote in a wonderful article about PRATEC in 2002. In the course of their professional activities they eventually came to the conclusion that development itself was the problem. This realisation did not come swiftly; it emerged slowly after a lifetime of professional activity in the service of development. At first they thought that things were not working because the methodologies that they used were faulty. They worked hard to devise better methodologies. They lived through many phases and fashions in development: community development; participatory development; appropriate technology; sustainable development; women and development. They tried everything available, always striving to capture the reality of Andean peasant agriculture and of peasant life in general. At long last they came to the conclusion that no methodology would ever deliver and that the problem lay in the very idea of development. It is at this juncture that they left their professional activities and their secure jobs and founded PRATEC, a non-governmental organisation. In other words, they deprofessionalised themselves. They had come to the realisation that development had failed. The evidence lay scattered throughout the Peruvian landscape in what some of their colleagues have called ‘the archaeology of development’, namely ruined infrastructures, abandoned to the elements after the project officials had left, uncared for by the peasants for whom they were intended and left to deteriorate. The evidence also lay in their experience of repeated efforts to devise better methodologies and the final realisation that within their professional perspective and constraints it was impossible to approximate peasant reality and therefore make development relevant to their lives. I especially like this image of an archaeology of development, the ruined traces of failed schemes dreamnt up elsewhere with different visions of the good life, now scattered across the landscape overgrowing with plants and home to birds and insects. I guess that the PRATEC team considers the landscape of development ideas to be similarly littered with half-baked schemes, now laying useless on the ground at the mercy of the elements, designed in the distant offices of some large organisation far away from the day to day lives of the peoples here in Peru. And in the picture below, just how many different cosmovisions, different models of how to develop towards the good life! In our meeting with Grimaldo he conveyed to us the story of the emergence of the organisation in the mid-1980s amidst a climate of violence and conflict in the country following from the guerrilla uprisings. 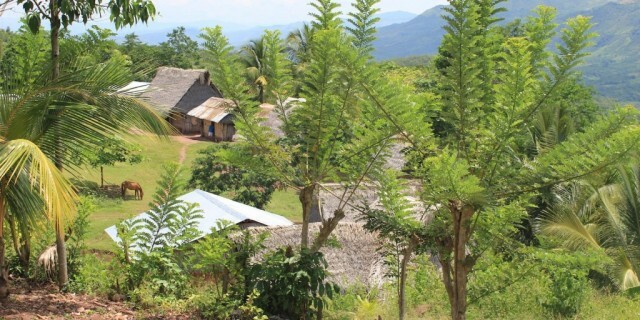 Decades of development projects, the effects of this conflict and of state-supported neoliberal encroachment on indigenous lands and resources had left these populations in a desperate state, destroying the cultural base or social fabric that had sustained these communities for thousands of years. 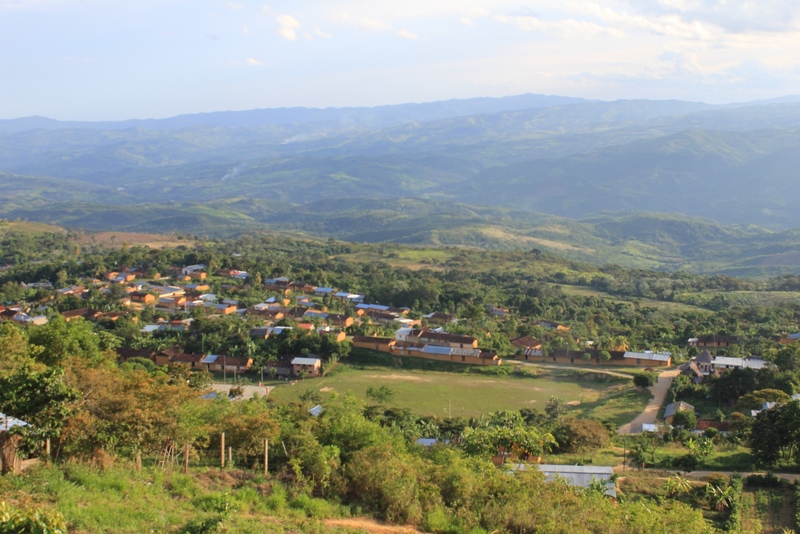 The conflict with the guerrillas alone, Grimaldo told us, had killed 70,000 people, the majority indigenous. From this period of the 1980s on, Grimaldo said that a new period of rebuilding had started amongst these groups and PRATEC had been a partner in this process. In Grimaldo’s case, and in the trajectory of PRATEC, this has involved coming to understand a different culture and cosmovision (a way of seeing and being in the universe) from his own. 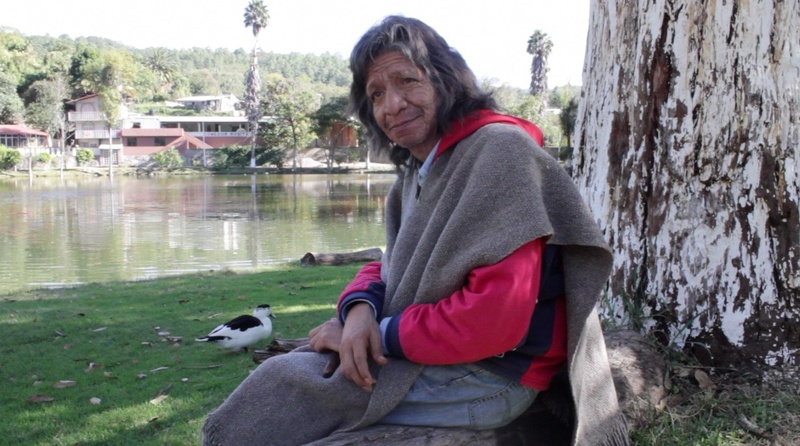 For Grimaldo the cosmovision of the Peruvian Andes was different to the Amazonian campesino culture where he was raised but also from the academic agronomy in which he trained in university. 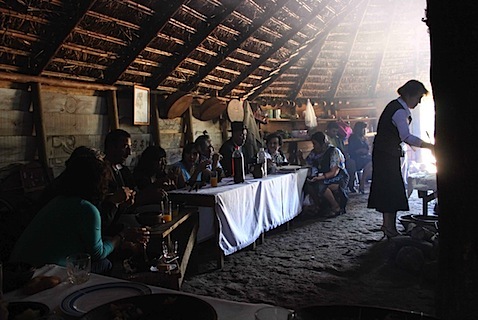 The fundamental and sustaining base of this Andean culture is agriculture and a cosmovision of crianza or nurturance that characterises people’s relationship to nature. We often came across this word crianza, we heard it in the town of Lamas, where the local project Wama Wasi, part of the PRATEC network, works with Quechua Lamas communities in this upper Amazon region. 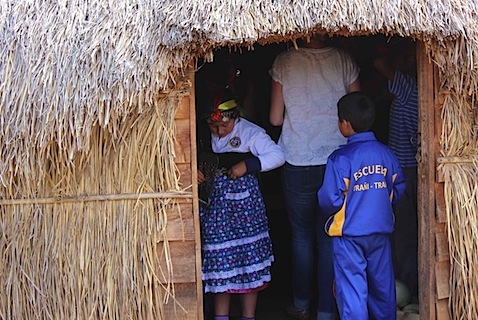 We heard it in our conversations with Elena Pardo in Cusco, from CEPROSI (Centro de Promoción y Salud Integral), also a part of the PRATEC network, which works with Quechua communities surrounding this region of the high Andes. We loved this term crianza, it has a depth and beauty to it conveying the heart of this cosmovision that is widespread in this region. 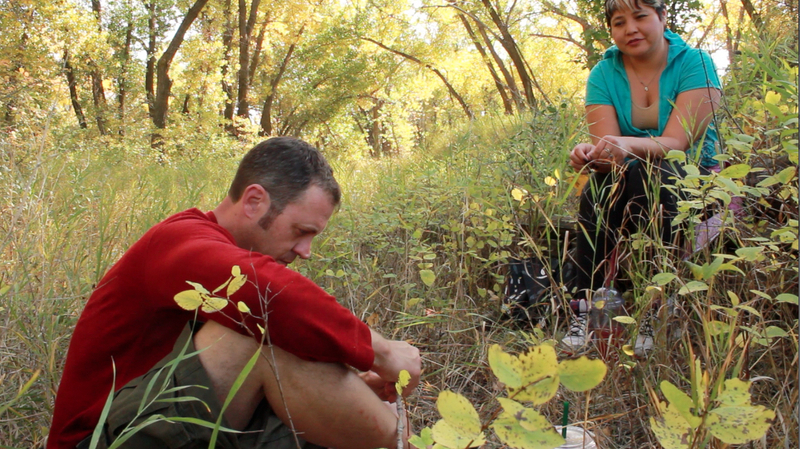 It also has deep resonances with Kelly’s previous post on Maize and milpa in Mexico, and on the buffalo in Alberta. In our understanding the term crianza means that people help create and sustain, or nurture, nature whereas nature in turn helps to create, sustain and nurture people. The relationship is one of kinship, of the same family, and as such quite different from a habitual way we have come to understand ‘agriculture’ where crops are ‘produced’. For here in ‘agriculture’ there is no sense that the ‘agri’ the crops, are also ‘producing’ us. This relationship, practice and understanding of ‘nature’ being outside of us and manipulated by us for our our ends, and increasingly purely commercial ends, is replaced by a sense of mutuality and reciprocity. I help the plants grow because they help me grow, and we are both part of a larger life collectivity which is, in this cosmovision, our mother earth, a living being that keeps us all alive. 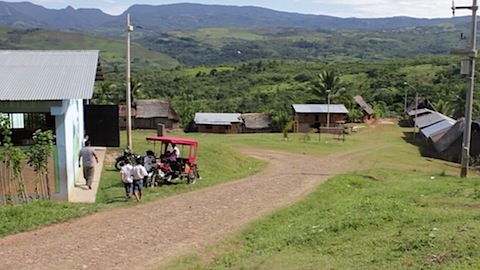 The uniqueness of PRATEC has been to practice a deep listening and learning from the indigenous communities they work with. Rather than begin with the view of ‘experts’ schooled in a particular cosmovision with keywords such as ‘progress’, ‘development’, ‘poverty-reduction’, ‘increasing yields’, ‘growing GDP’, ‘crop production’, PRATEC has instead payed attention to the values and cultural practices that have sustained the life of these communities in these places for thousands of years. Coming to know these values and practices, such as that of crianza but also those surrounding the chacra, the actual field or place where the nurturance is practiced and which makes up most of the community’s working life, was the first step in the trajectory of PRATEC and its founders. 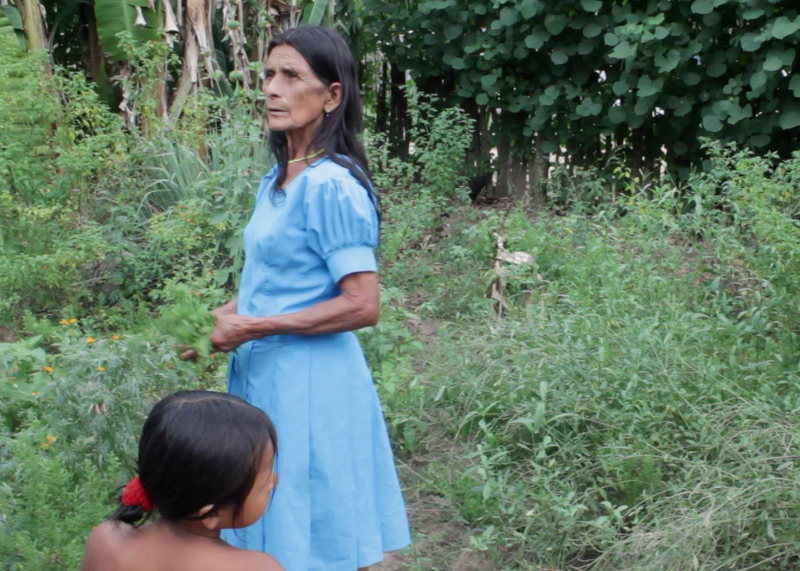 We will write more on the chacra in a later post though just briefly we could observe how central this was for the Quechua Lamas communities we came to know and how similar to the Mexican milpa this was (see Kelly’s posts on Maize and Milpa). PRATEC’s next stage, as Grimaldo narrates in our interview, involved disseminating this particular understanding of close listening and knowing to others. To this end they spent a period of over fifteen years conducting courses across Peru to different groups of professionals and students. This gradually led to a consolidation of a group of people across the country, development and agriculture professionals, teachers and community activists, who were keen to practice this alternative approach to development. 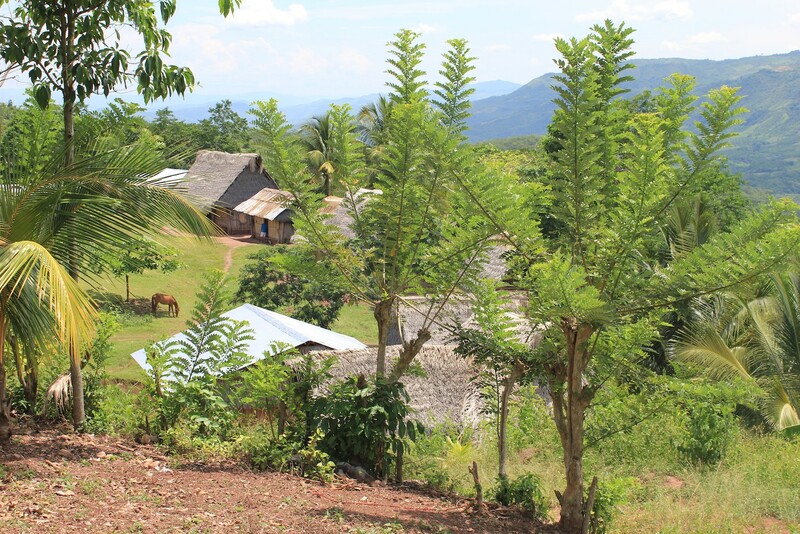 PRATEC’s next phase of work has then been guided to strengthening these local practices and systems so as to fulfil not an external expert’s conception of the good life, or of development, but to actualise what this means for the people themselves. All of this has involved a great deal of unlearning and of re-learning from the people who work at PRATEC, comprised amongst others of university educated agronomists, agricultural engineers, educationalists, and others. 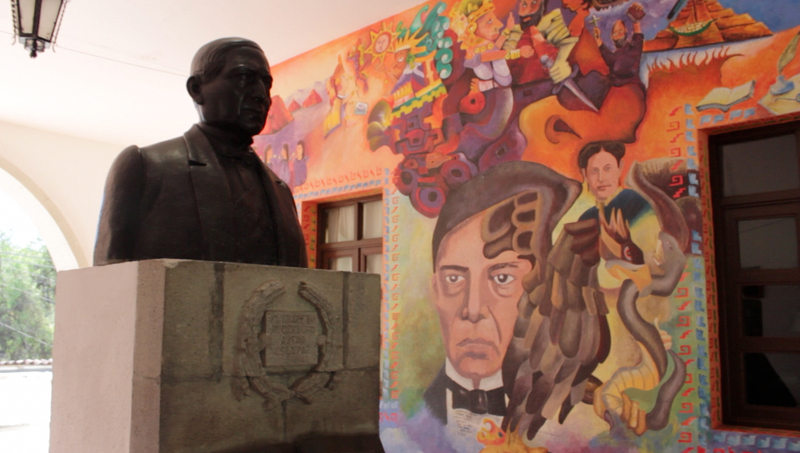 Like Grimaldo, others we talked to in PRATEC describe this process of questioning the assumptions they learned in these academic and development institutions and in the cosmovision that sustained the forms of knowledge and values that were reproduced here. So pervasive and powerful has been the force of this cosmovision promoting a particular kind of technology-driven and market-oriented development and progress, that one important strand of PRATEC’s work with local communities involves redressing the de-valuing of indigenous ways of life which has been happening since the arrival of the Spanish five hundred years ago. What has been interesting to note is that though many of PRATEC’s founders and those they work with now started in the field of agronomy most of them now are actively involved in working in the area of education. As Grimaldo says the latest stage in PRATEC’s trajectory has been to work with schools and with education policy as a way of strengthening local ways of knowing. 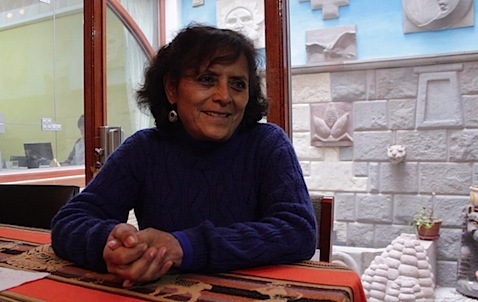 Important in this shift is also the work of Elena Pardo in and around Cusco, someone who does have a background in education and worked for many years in the Ministry of Education before starting CEPROSI. 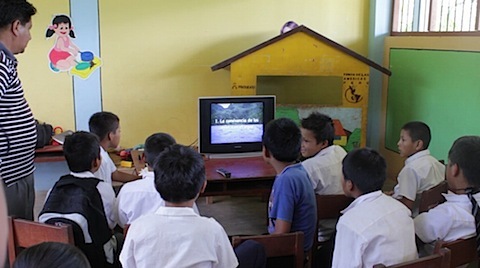 Here in Peru, as in Mexico and Canada, we found the school as a key institution for the dismantling or the reproduction of a particular cosmovision. How PRATEC and its affiliated organisations work with schools is the topic of the next few posts. 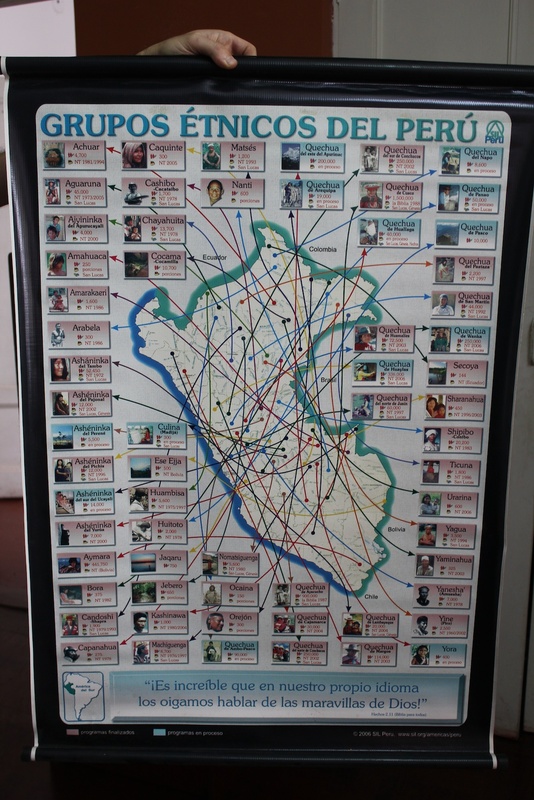 PRATEC’s approach to development, some label it ‘post-development’, is both well-known across Peru and internationally and is both respected and controversial. 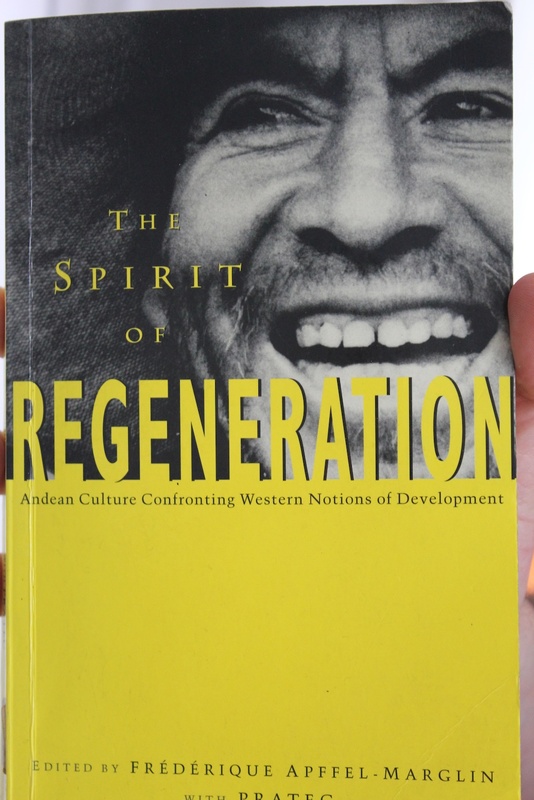 It challenges thinking about who the experts are, who should have the right to impose development (particularly with certain ideas of progress) on a community, what kind of development or conception of the good life ought to underpin these. 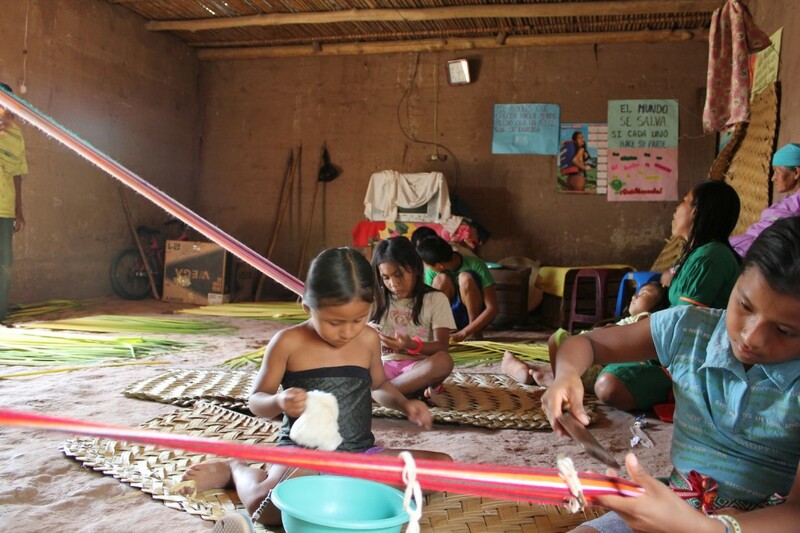 When we visited one of PRATEC’s many umbrella organizations (this one called Waman Wasi) in the upper Amazon region of Lamas, we were told how the area is filled with different development initiatives by numerous organisations, each with its own set of experts, advice and models. 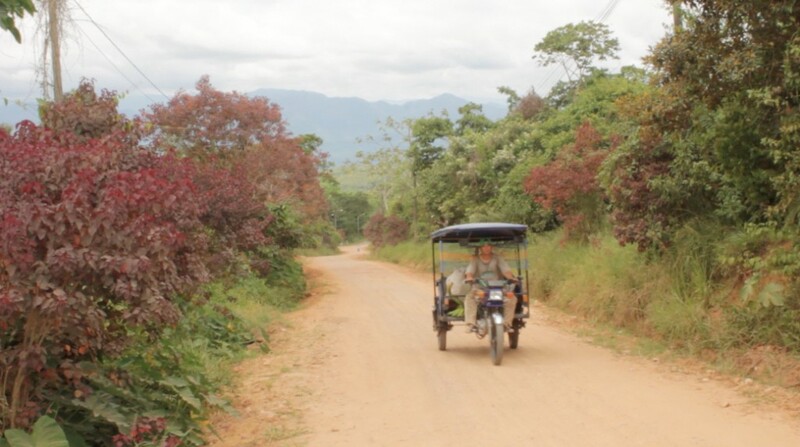 Some offer incentives for the Quechua Lama to grow coffee or cacao for export. The rationale is that the Quechua Lama ought to enter into the global monetary economy to meet their needs, as they are money poor. For Wama Wasi, whom we spent time with, this approach does not recognise the self-sufficiency of these communities and the food security they already have, nor how the chacra embodies a cosmovision that sustains a whole way of life, not only materially, but also culturally, in terms of family roles and relations, and spiritually. 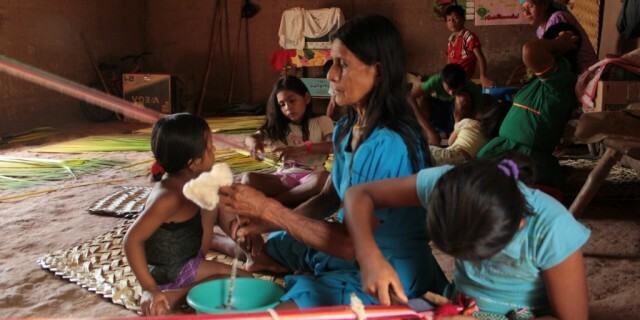 Though they are money poor their sense of the good life, buen vivir, is found not in having and owning stuff, but in relation to crianza, to the chacra, and to other elements of their cosmovision that supports their being in the world.